When Should Nonprofits Consider Making A Transformative Change? Restructuring the Governance Model – Nonprofit boards have been governed in the same ponderous community mode, with its board micromanagement for a hundred years! Since the 1980s I have been involved in helping mature nonprofits remodel the traditional and often cumbersome process, suggesting that updated structures will more effectively facilitate the important work of the organizations, i.e. to increasingly improve client outcomes. My challenges were to help find a way of allowing the board to focus solely on their responsibilities for developing policy, strategy and implementing board oversight of operations. The CEO must have full authority over operations. The new model would establish a robust assessment process and discourage both the distraction of director micromanagement and the proliferation of redundant committees. Here are some of my observations on the successes and sticking points of the transition period. •	Consensus is critical. Both a majority of board opinion leaders and CEOs need to buy into the governance transformation. Total agreement is not possible—directors may resign, preferring status quo to the uncertainty of innovation. Some CEOs may be uncomfortable with the new responsibilities. This may require a change at the CEO level and with his/h direct reports. Board chairs and CEOs need to delineate their respective responsibilities and invest the resulting partnership with a high level of trust. 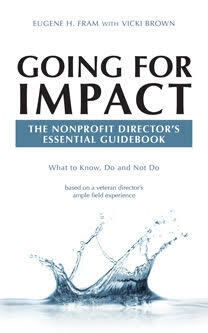 •	Nonprofits tend to be risk averse—board cultures that can inhibit or support change. Once the decision has been reached to move forward in the governance revision, it is absolutely imperative that the leadership from the Board and CEO be strong and fully committed to implementing the change. •	3-5 years is commonly the time it takes to acculturate a group of directors to a new governance model. Then it makes sense to follow up by recruiting new directors who see the advantages of the new plan. •	The good news is that restructuring has produced excellent results. Since 1980, countless nonprofits have tested its efficacy and adapted it to their own organizational needs, never returning, to my knowledge, to the old format. Establishing the new model may solve internal problems and even help provide growth opportunities. Its enhanced sense of professionalism will eventually improve services to clients and enable nonprofits to recruit and provide more meaningful experiences for directors in expediting achievement of the nonprofit’s mission. •	The March of Dimes is a classic example of the need to replace an outdated mission with a statement that represents more current objectives.. Founded in 1938 by FDR to help cure polio, the discovery of the Salk vaccine in 1955 rendered the mission irrelevant. The nonprofit carefully and successfully transitioned to a revised format that focused on providing support and research for prenatal care and infant disease. It is still a vital human service today. •	Mission “creep” in a nonprofit is sometimes viewed as an abandonment of cause. Seeking funds, only tangentially related to the mission, can be dismissed as a serious transgression by those who want to maintain the status quo. In fact, small fund developments for experimental advancement, when part of a strategic plan, can be worthwhile experiments that actually strengthen the mission. •	The two committees develop a single proposal involving a myriad of details such as financial arrangements, office leases, and personnel layoffs due to duplicated services such as accounting. They decide on the new board format and identify the CEO who will head the merged organization, sometimes a fragile decision if both are competent. •	Proposal for the merger is presented to both boards. The assumption is that the vote will not be unanimous –some directors will find reason to opt out. •	Once the boards have approved of the partnership it usually takes about two years to complete the merger process. •	The results: the new organization is equipped to deliver enhanced services, have a stronger voice with peers/donors and attract more widespread support. •	Beware the honeymoon period! Like a marriage the initial period is likely to be harmonious, But be on the alert for the cracks that appear due to cultural differences, which if they remain unhealed can eventually undo the new partnership.